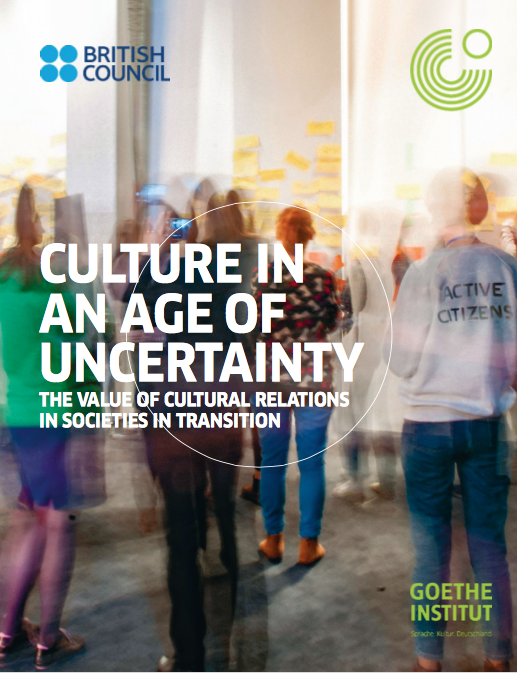 The British Council and Goethe Institute have published a new report co-authored by Ben O’Loughlin and colleagues exploring how cultural relations activities are valued in societies in conflict — specifically Egypt and Ukraine. For 18 months Ben and colleagues evaluated how Egyptians and Ukrainians engaged with the language programmes, film nights, theatre productions, virtual museums and other cultural activities offered by the British Council and Goethe Institute in their countries. They specifically explored what people found to have ‘cultural value’. They found important divisions between urban and rural populations and across age groups. In theoretical terms, they found that some cultural relations work through a network model, some through a cascade of norms, and some through a norm diffusion process. Crucially, they found a huge appetite for cultural exchange — people in Egypt and Ukraine saw cultural relations with Britain and Germany as a way to improve their own societies. These findings have implications for Ministries of Foreign Affairs that fund cultural relations, for diplomats and staff officers running cultural relations programmes, and for citizens who would like to get the most out of cultural exchange. The full academic report (200+ pages) is available here. The team’s literature review comparing British and German approaches to cultural diplomacy was published by the British Council here. The project was led by Prof. Marie Gillespie of the Open University. Marie and Ben have spent over a decade researching and evaluating soft power, public diplomacy and intercultural communication.